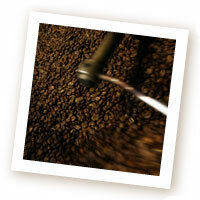 At Highland Coffees we offer a range of roasts, going from full-flavored medium to very dark. We also sell decaffeinated coffees, flavored coffees, and blends. What they all have in common is that the beans are of the highest quality, and they are all skillfully roasted right in our shop. In addition to reading below about our roasting process, view our Coffee Profile Chart for descriptions of the individual coffees we roast. Green coffee is very hard to the touch and feels like cool pebbles in one’s hands. All of the flavor potential is locked inside of the green coffee and is only brought out through the roasting process. The Probat small batch coffee roaster we use at Highland Coffees is essentially a rotating oven. Green coffee is held in a hopper at the top of the roaster while the temperature of the roaster heats up. When the proper temperature is reached, the beans are released into the roaster drum where they are tossed continuously for even roasting. Coffee roasting takes anywhere from about eight minutes to fifteen minutes, depending on many factors, including the origin of the bean being roasted, the level of roast sought, and the size of the batch, which can range from 7 to 25 lbs. 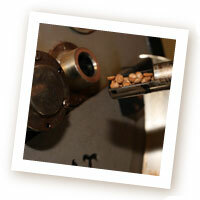 For darker roasts beans are left in the roaster longer and go from medium brown to darker brown tones. A second, very rapid, pop occurs as the beans’ cellular structure breaks down. Oils created within the beans make their way to the surface. The beans can be pulled at any point during the second pop, depending on how dark the roaster would like to take the batch. In our French Roasts, the beans are about half-covered in oil. Our darkest roast is our Italian Roast, which is taken out of the roaster at the very end of the second pop and is completely covered in oil. The bittersweet taste brought on by the dark roasting combines with lingering flavor notes unique to the particular bean to create the flavor of a French Roast. With the Italian Roast, few traces of flavor unique to the bean remain. A deep, smoky flavor dominates. When the decision is made to pull the batch, a door on the front panel of the roaster is opened and the beans tumble out into a large round cooling tray. A rotating arm stirs the beans. Cool air is pulled through small holes in the tray in order to cool the batch as quickly as possible. The beans are now ready to be bagged and placed on the retail shelf or shipped to our online customers. 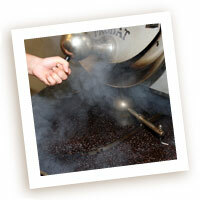 The aroma of fresh roasted coffee fills the shop.